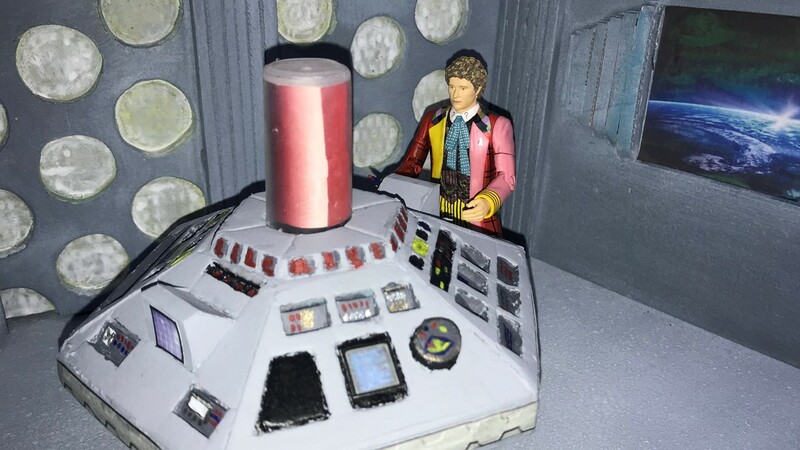 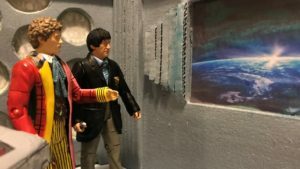 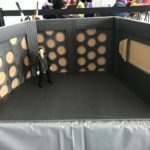 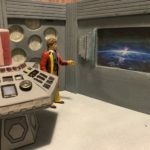 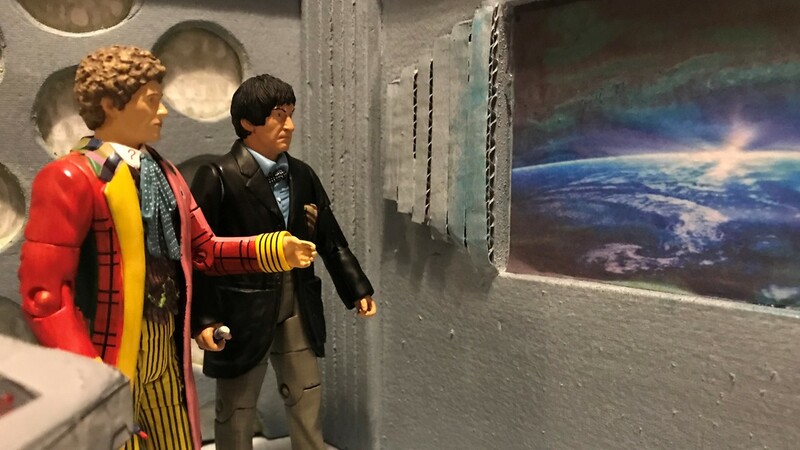 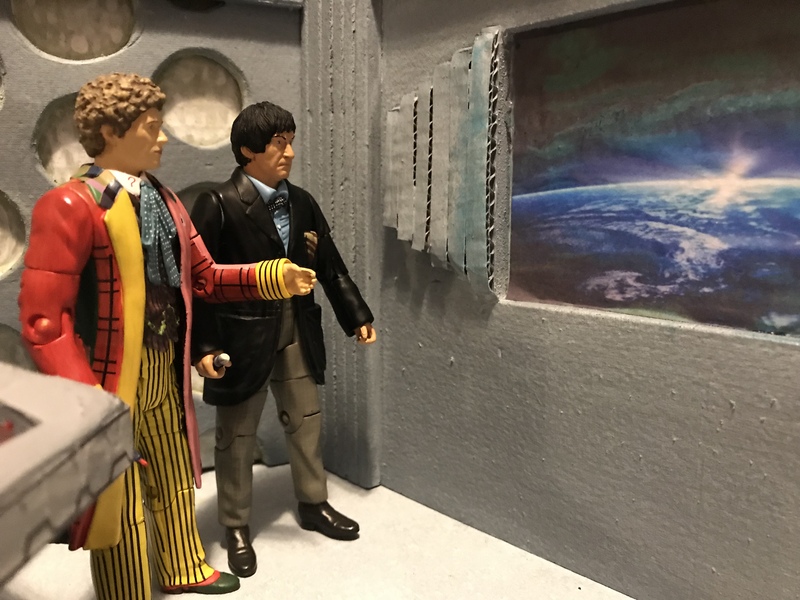 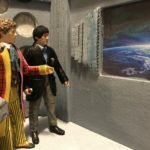 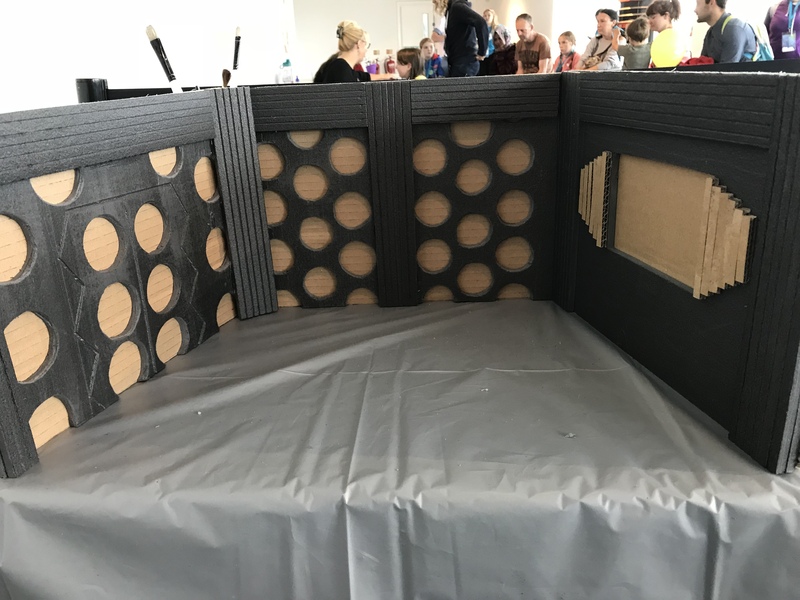 The task I assigned myself the weekend of attending the Bradford Science Festival was to build an 80’s Tardis interior from the days of the 5th Doctor Who Peter Davison and Colin Baker. 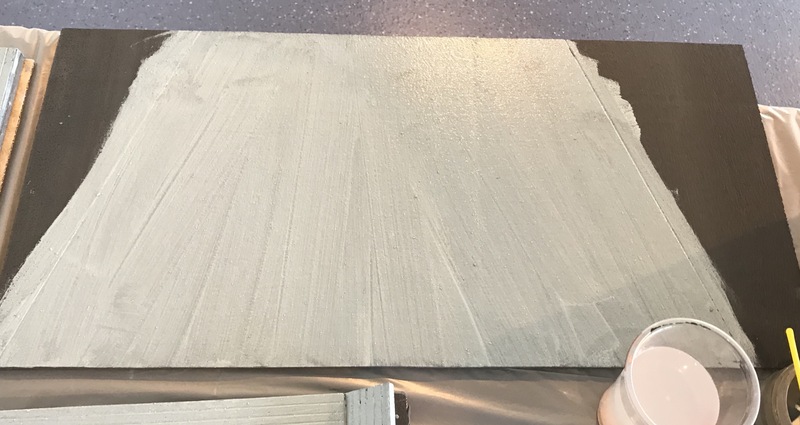 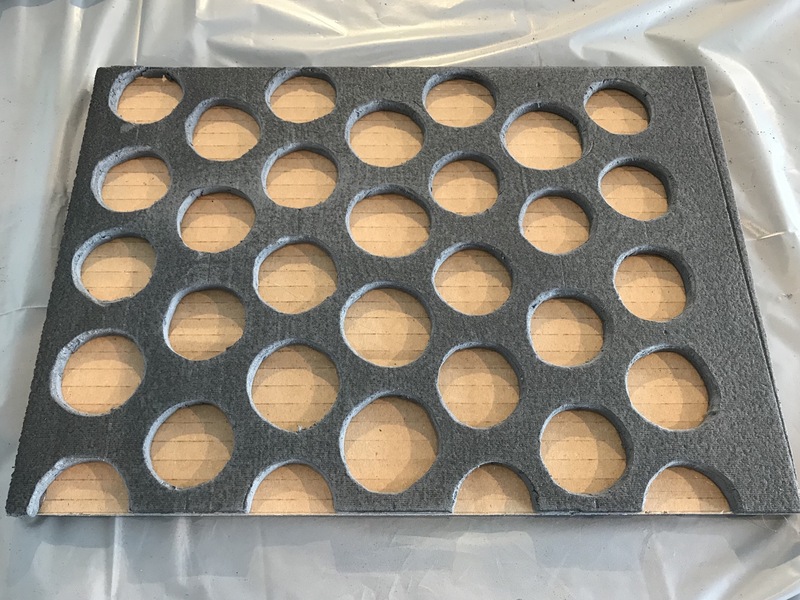 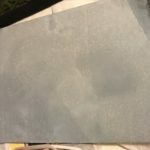 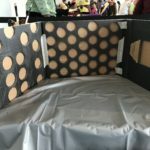 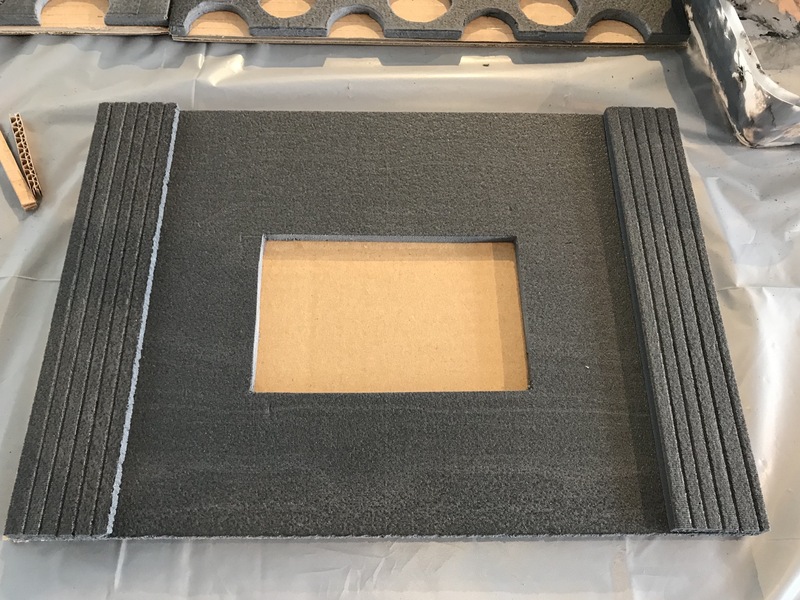 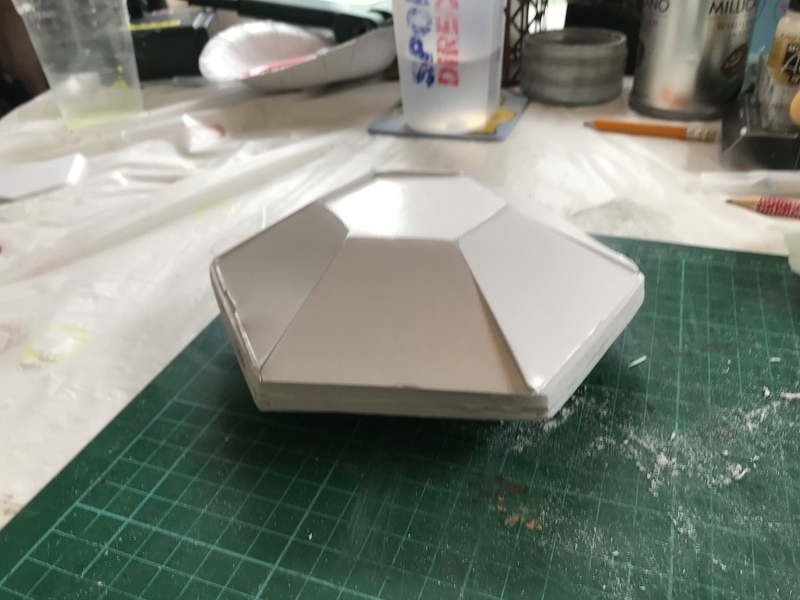 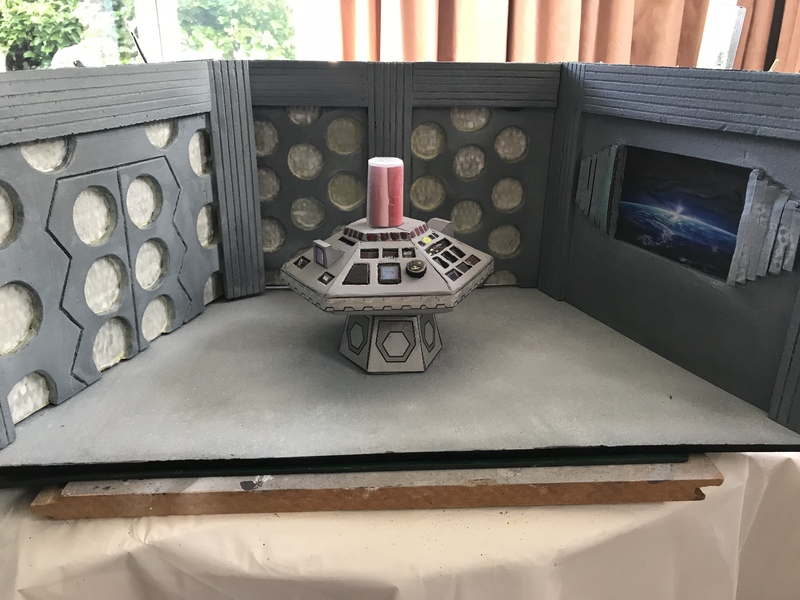 This build will mainly be done using 5 mm insulation board but instead of using 10 mm board to mount it on, I am using sheets of cardboard instead to show people that they can use basic materials found around the home, than having to purchase foam board. 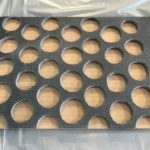 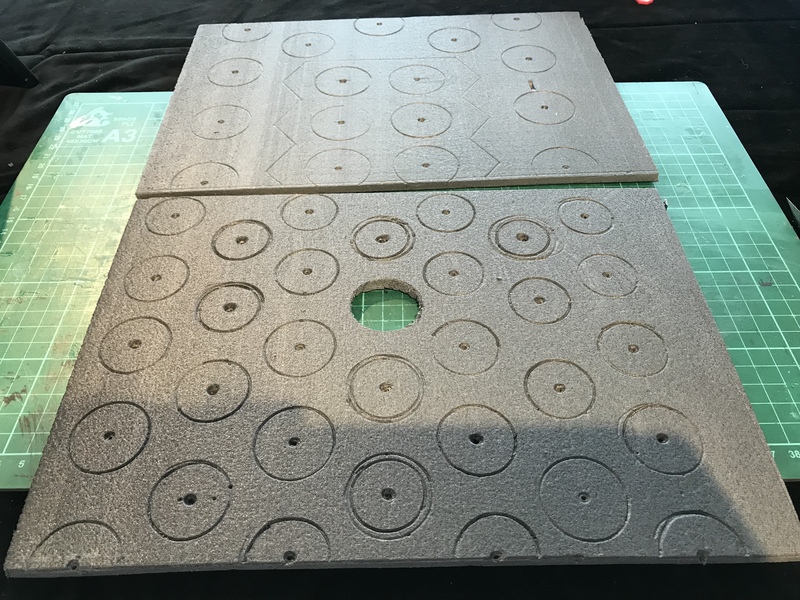 Using a compass to mark the Round Things on two of the foam boards, using a fine point scalpel to cut each circle out. 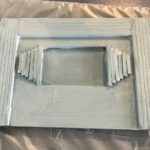 I took my rotary tool to carefully sand out the bevels and tidy up the edges. 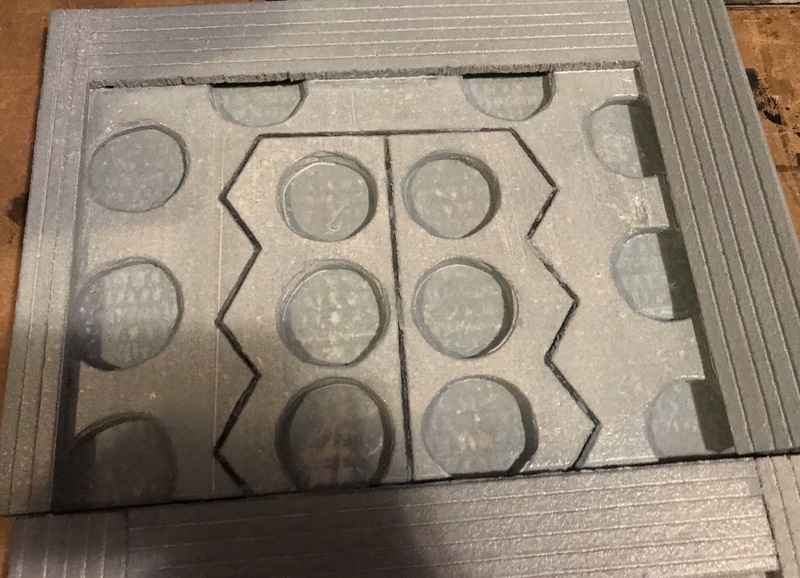 I used an engraver to soften the edges around each hole. 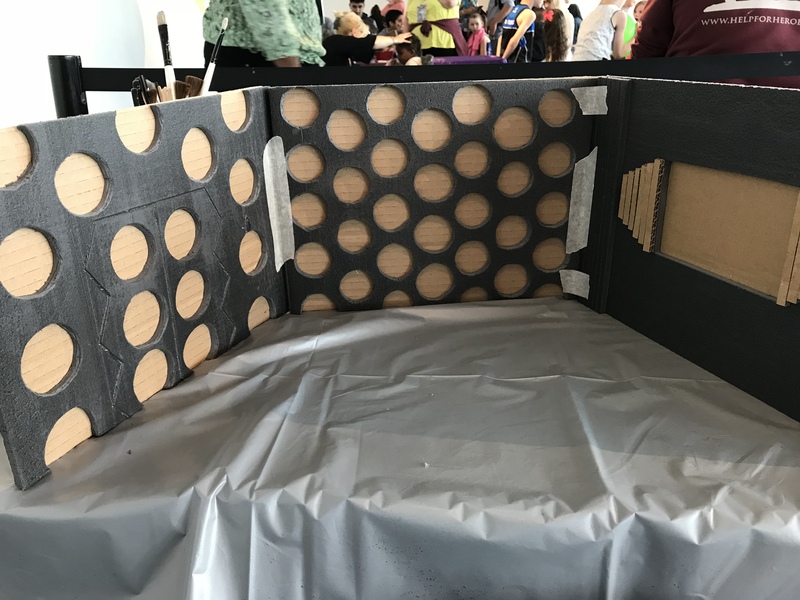 The third wall 3″x 3.5″ rectangle was cut for the monitor, and pairs of cardboard strips where placed either side of the screen. 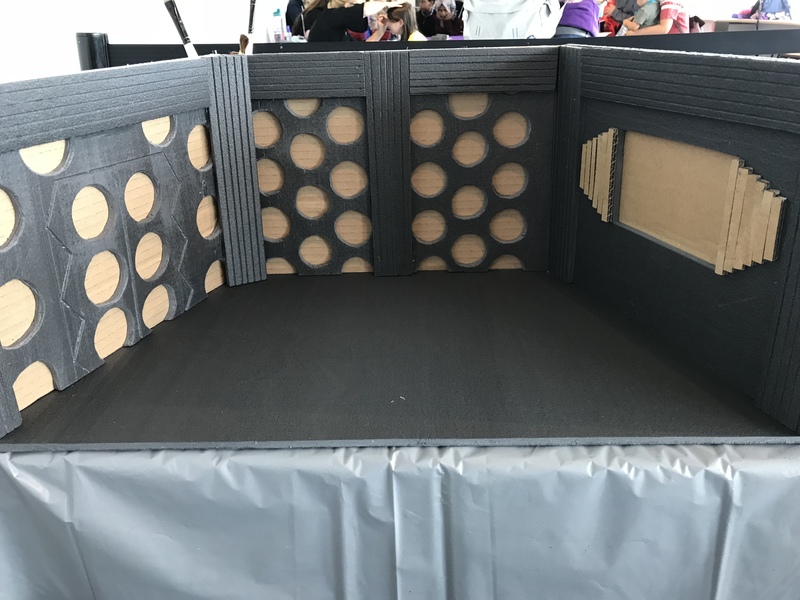 Each piece of foam where then glued to a piece of cardboard, strips of foam board were cut and shaped into the edges of each of the walls. 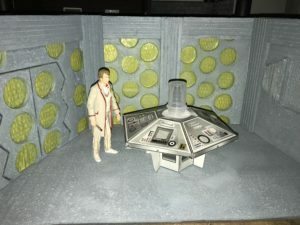 An A3 piece of 5mm foam board is being used as the base for this diorama. 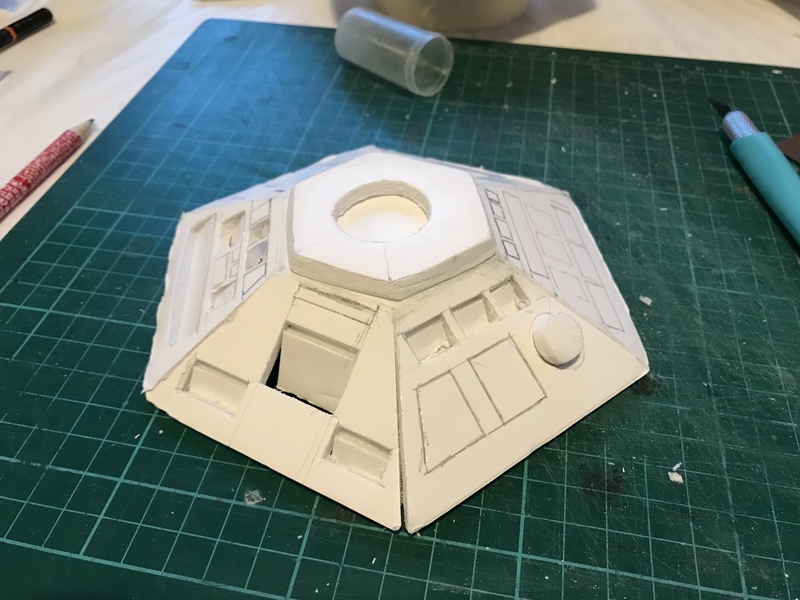 With the pieces in place it is now time to paint this build. 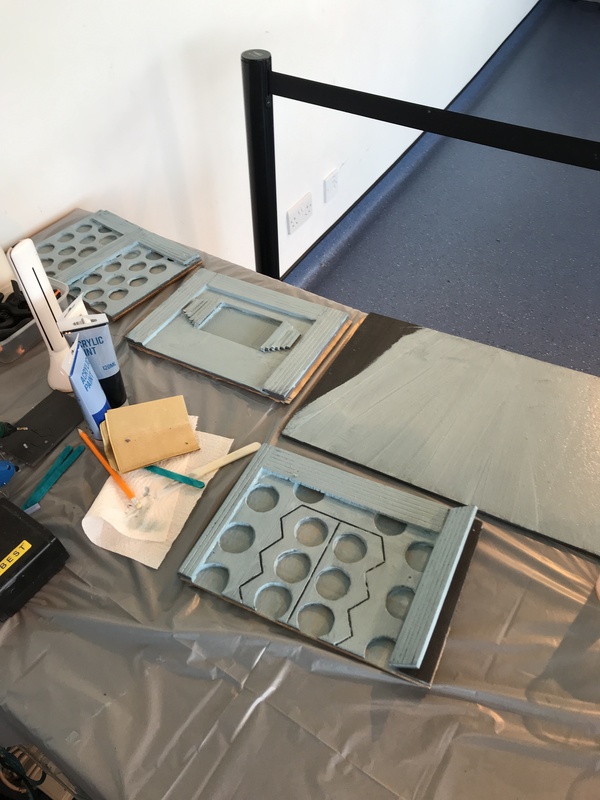 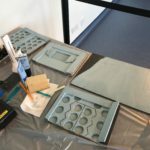 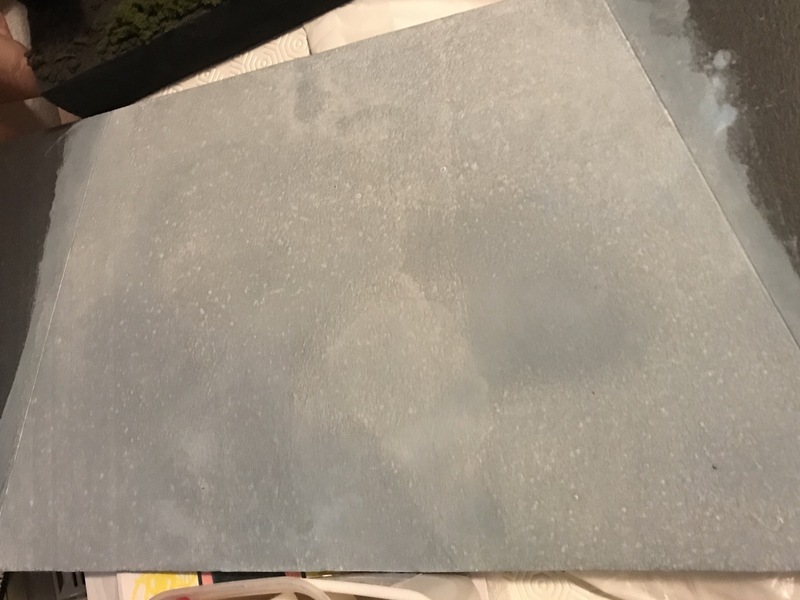 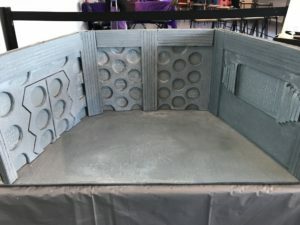 Mixing up a light blue/grey and spread it over the entire diorama using a sponge. 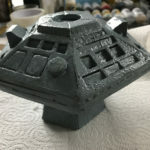 Once the this had dried, I used my airbrush to apply the second coat of paint. 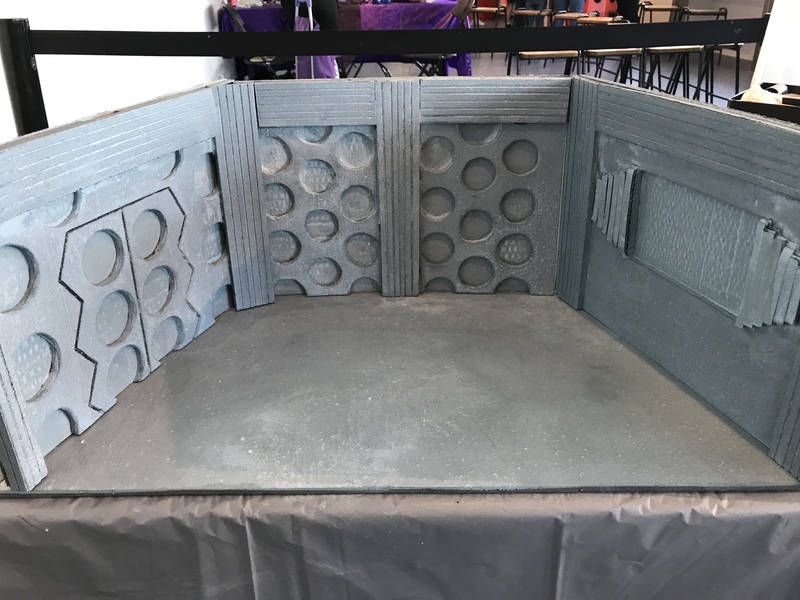 Unfortunately the second coat did not dry in time before the close of the festival, I will be finishing this build of over the course of this week. 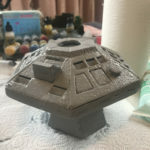 I was not happy with the shade of grey the last paint job finished at, mixing up a very light shade of grey I repainted the entire model again. 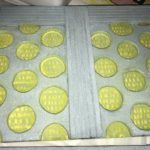 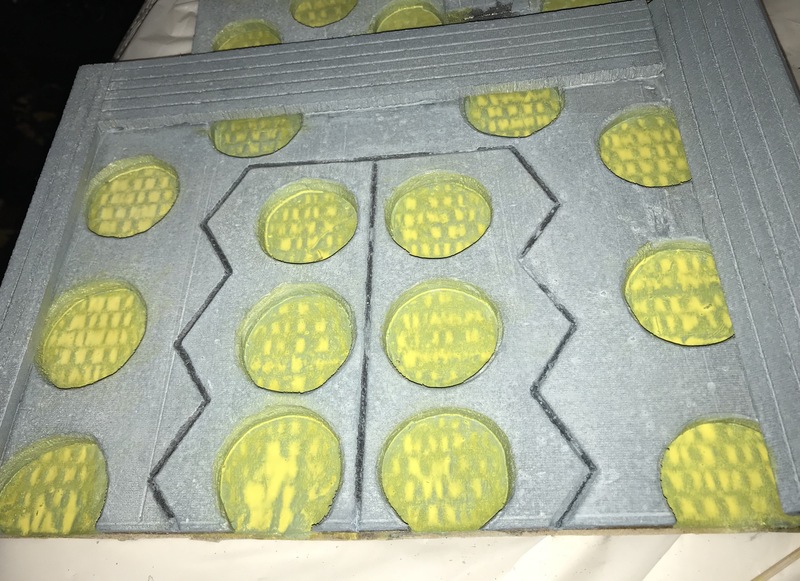 When that had dried and much happier to how it was, I mixed up a light shade of yellow and using my airbrush I painted all of the round things. 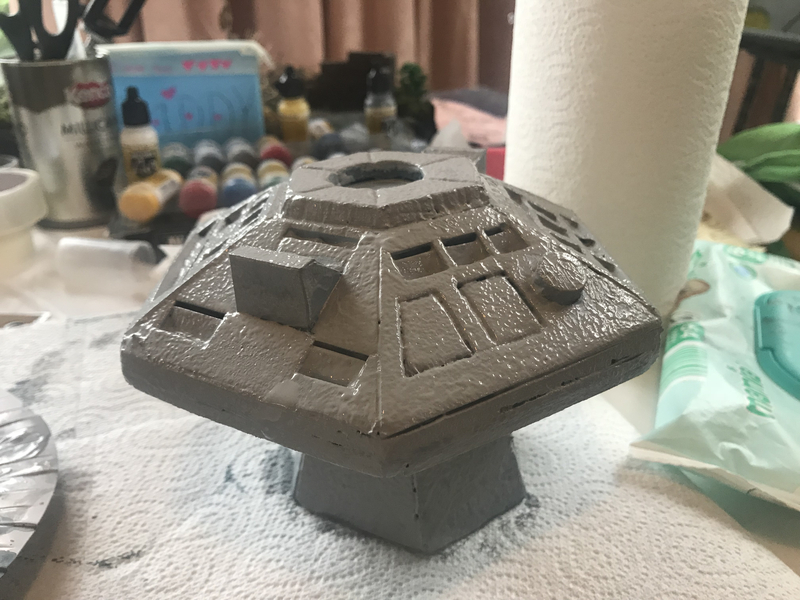 I may end up by going over these again using a paint brush and thicker paint. 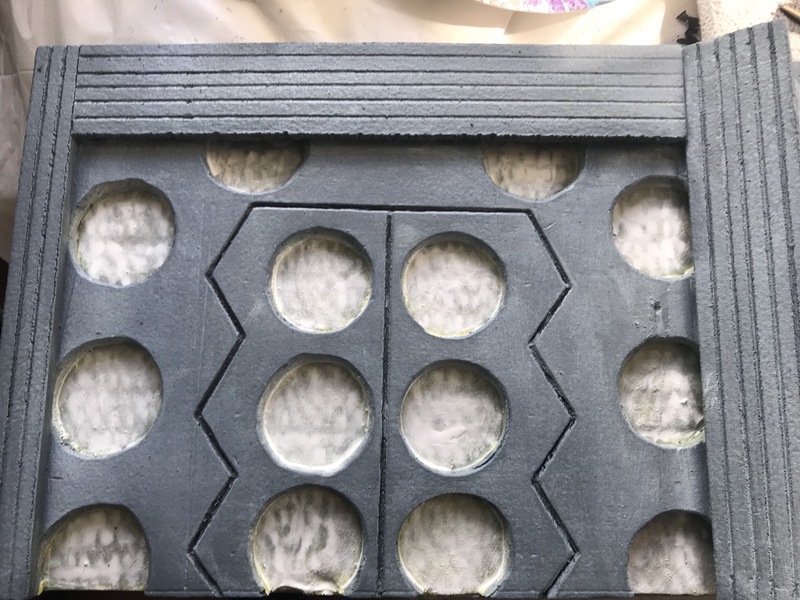 Using my airbrush and watering the paint down, it has had a bit of a reaction with the cardboard back. 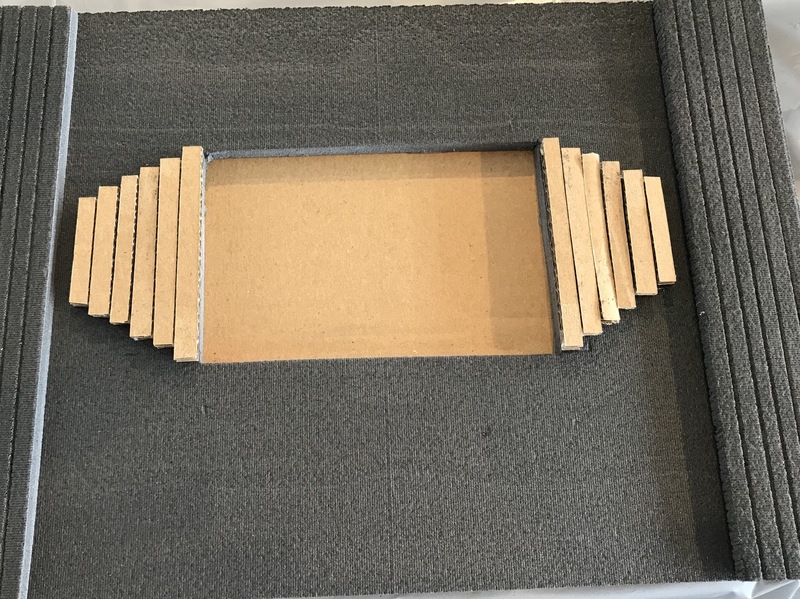 As you can see, you can start to see the corrugated cardboard which is in between the cardboard. 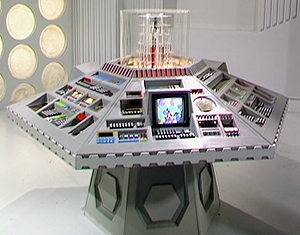 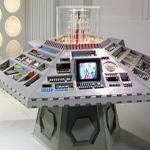 Still when you stand it together with a console and a figure is starting to look like a 80’s Tardis. 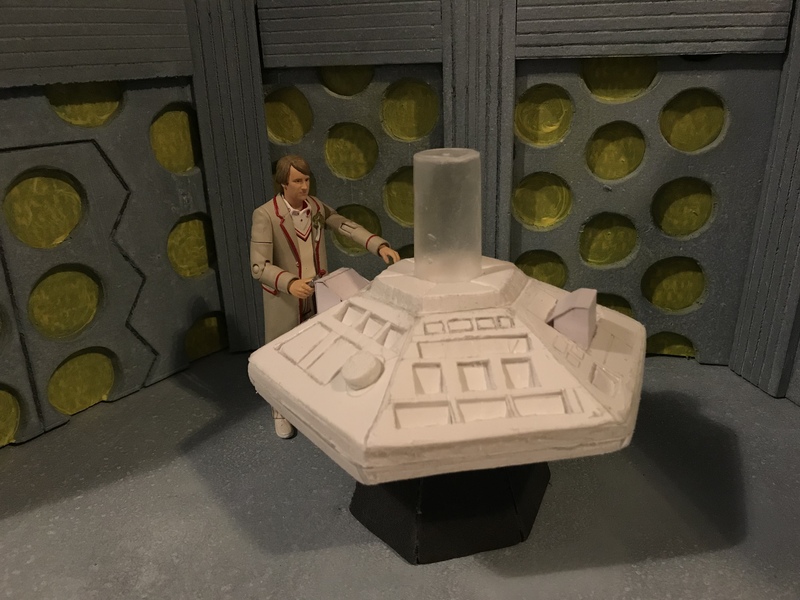 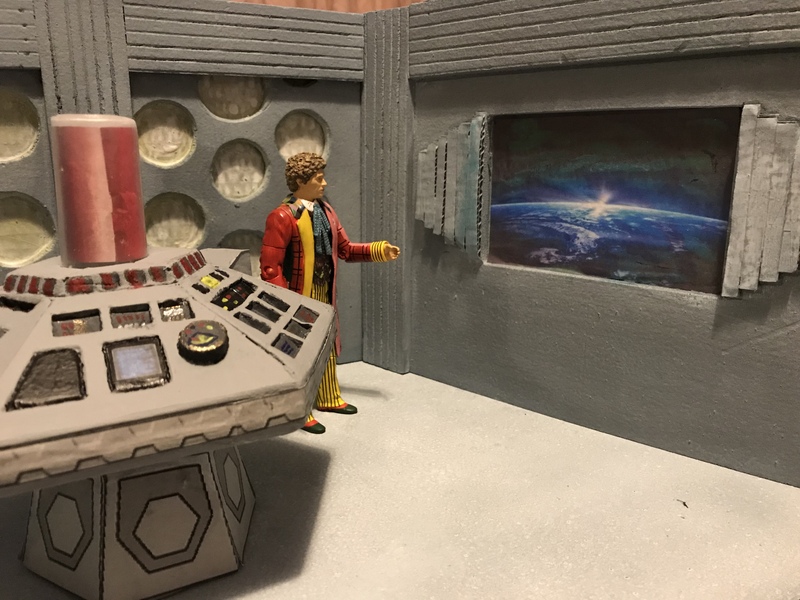 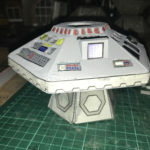 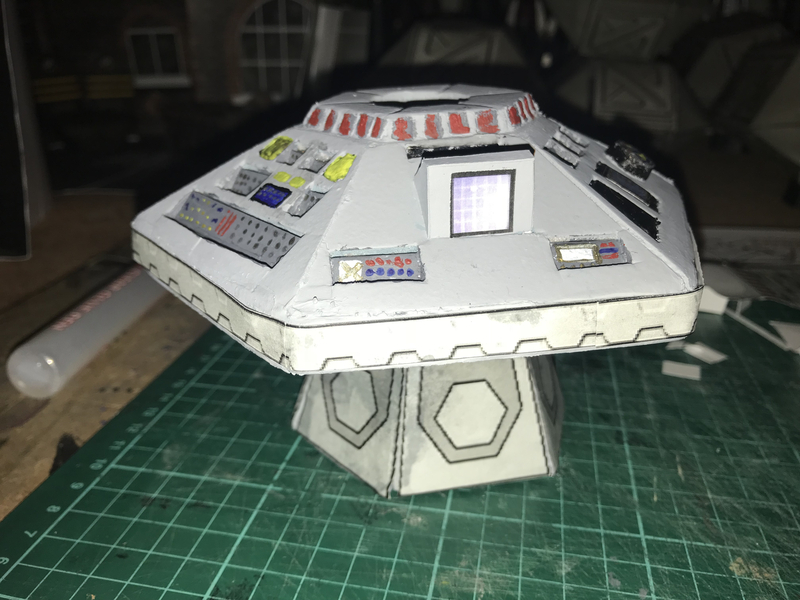 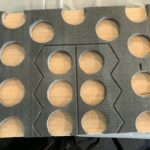 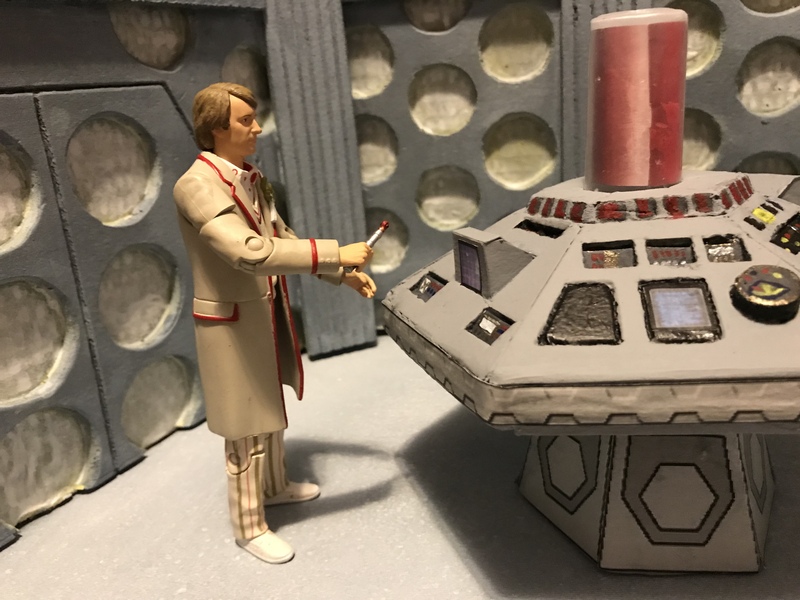 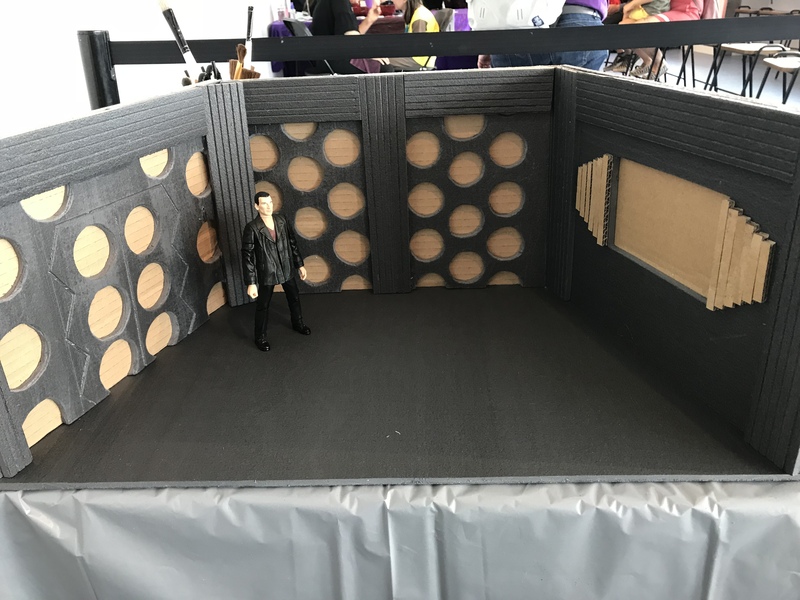 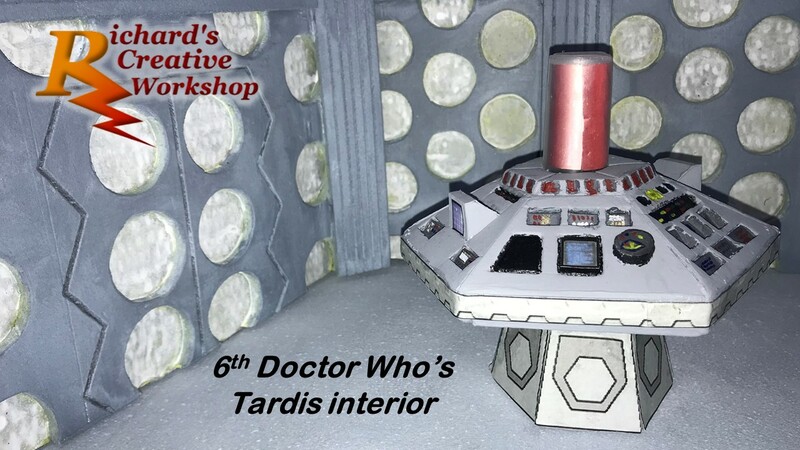 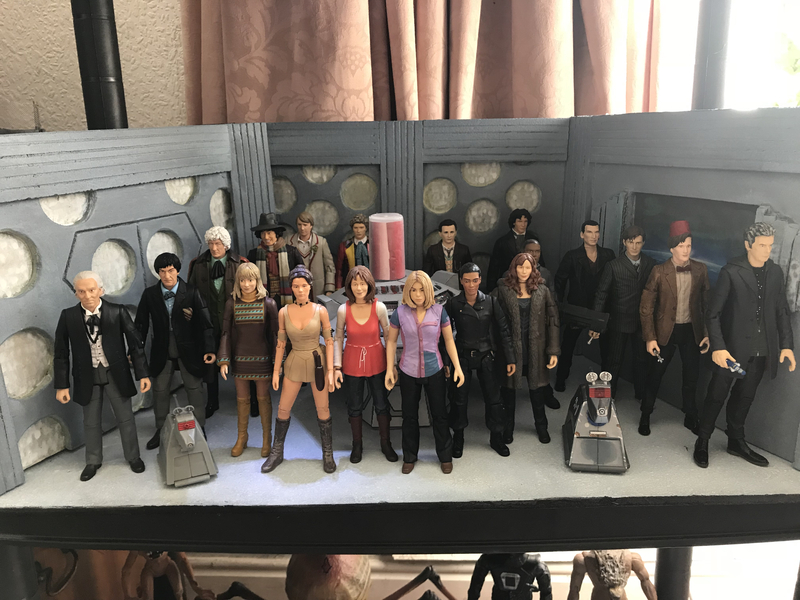 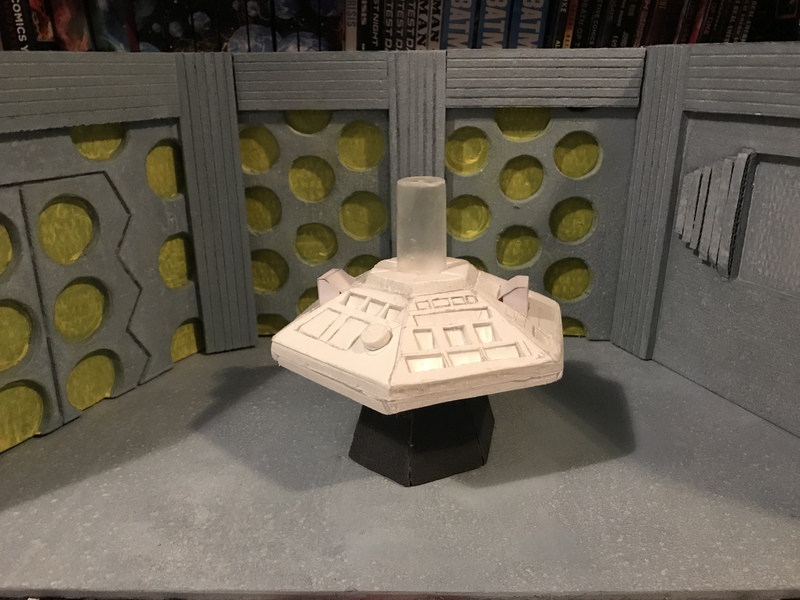 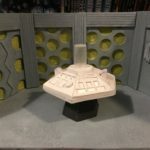 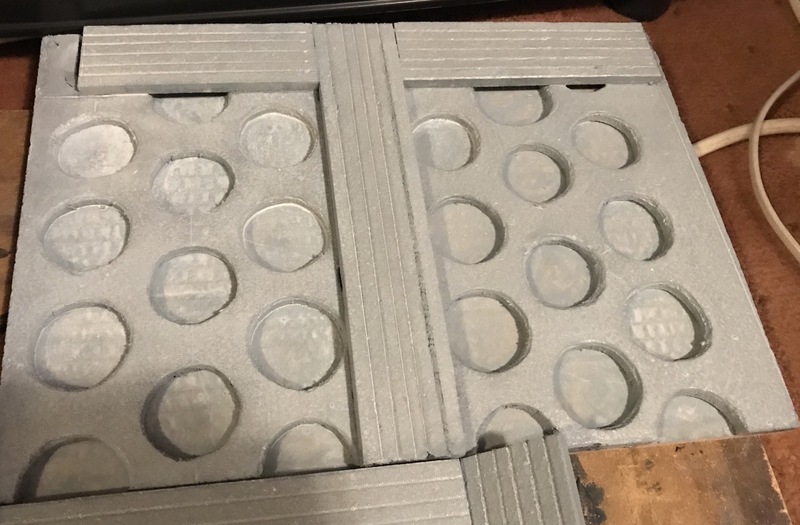 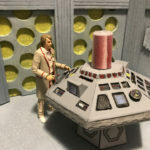 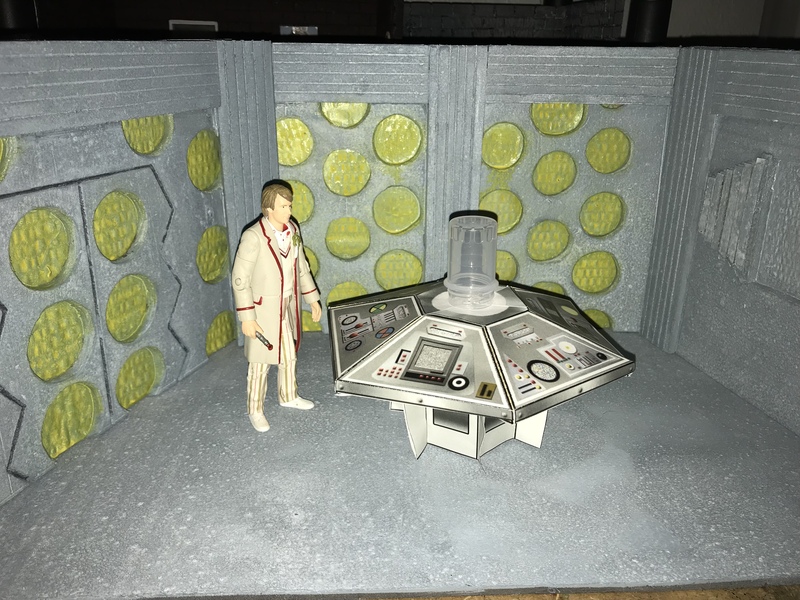 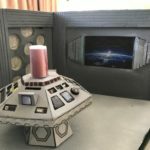 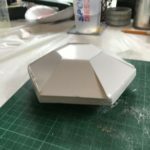 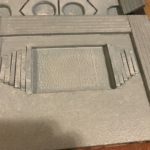 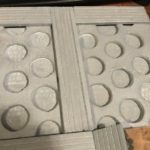 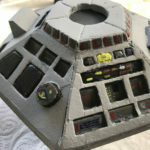 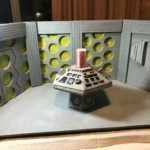 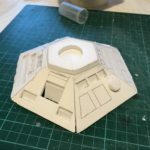 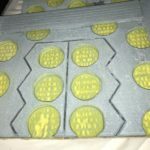 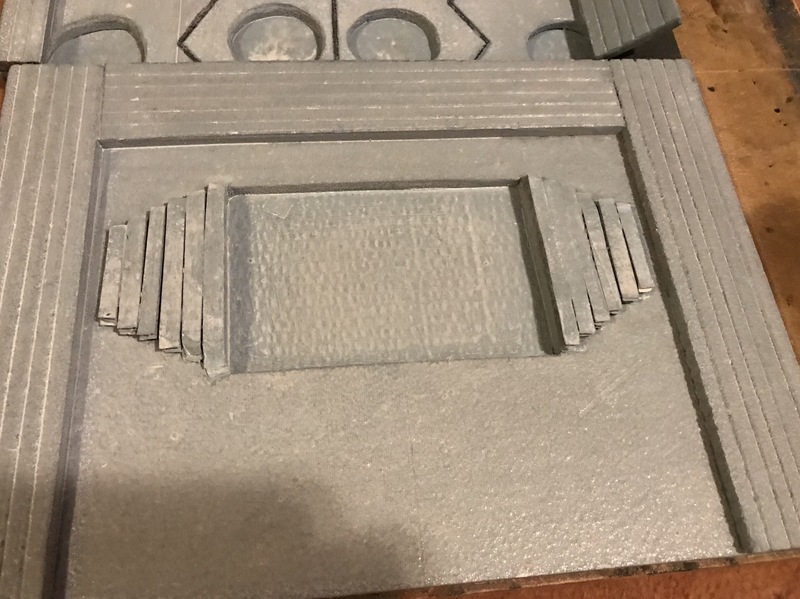 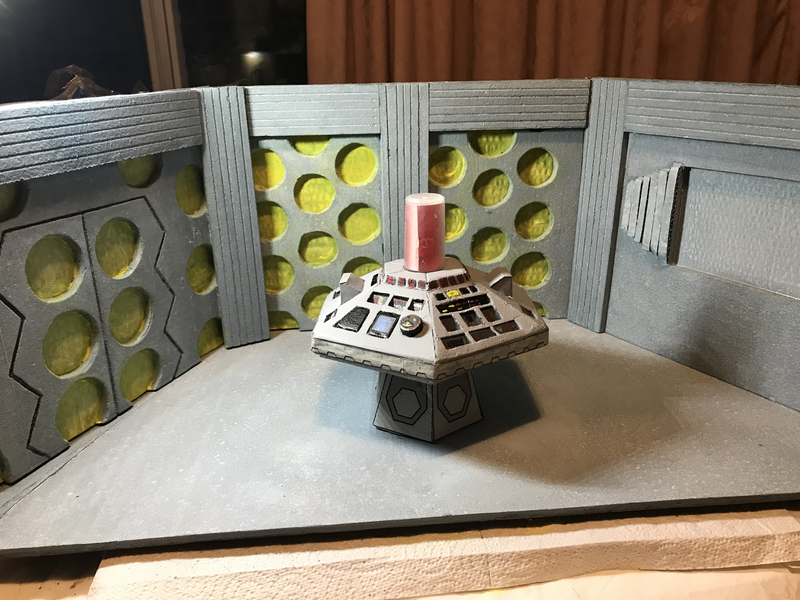 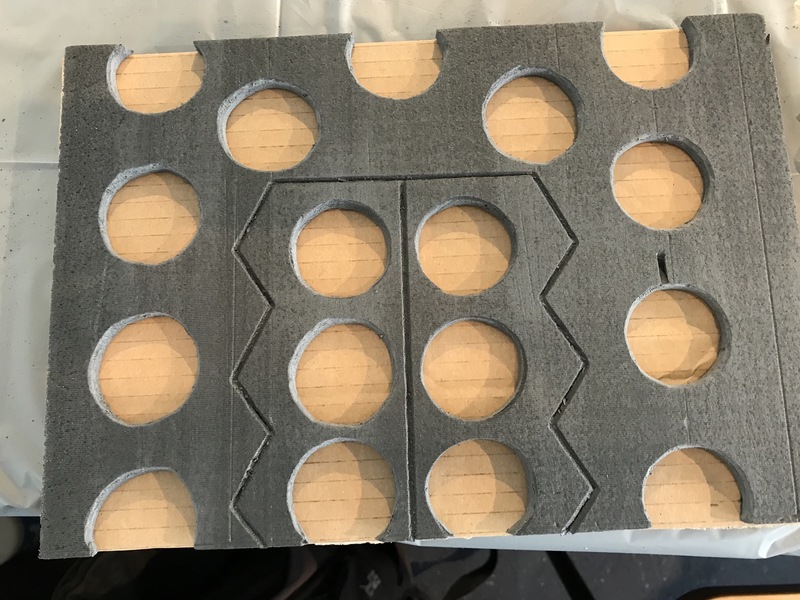 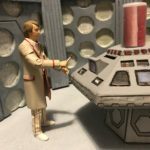 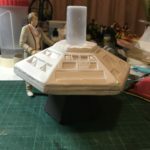 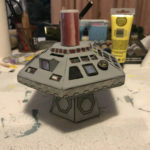 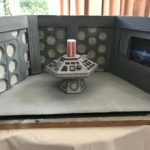 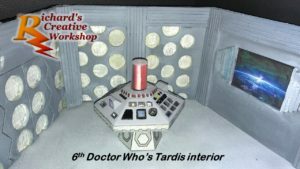 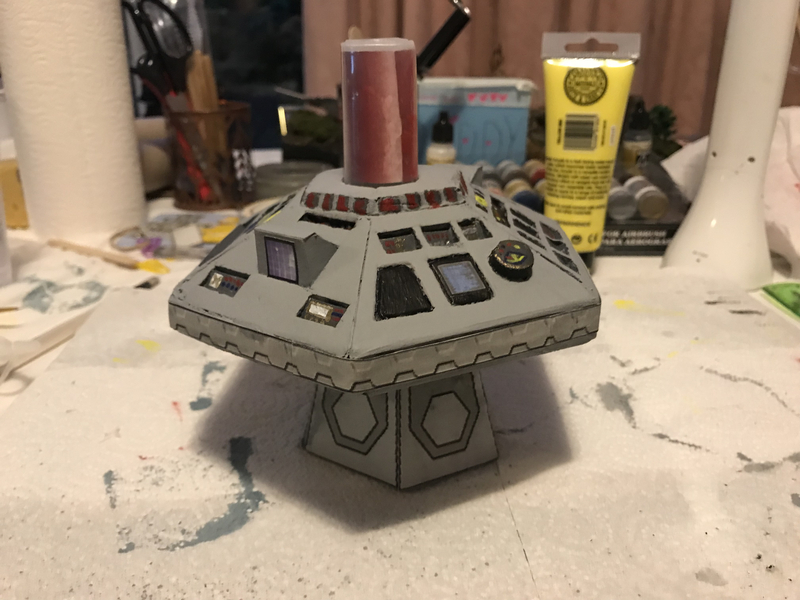 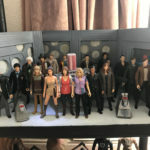 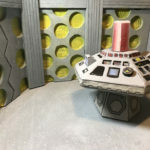 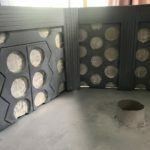 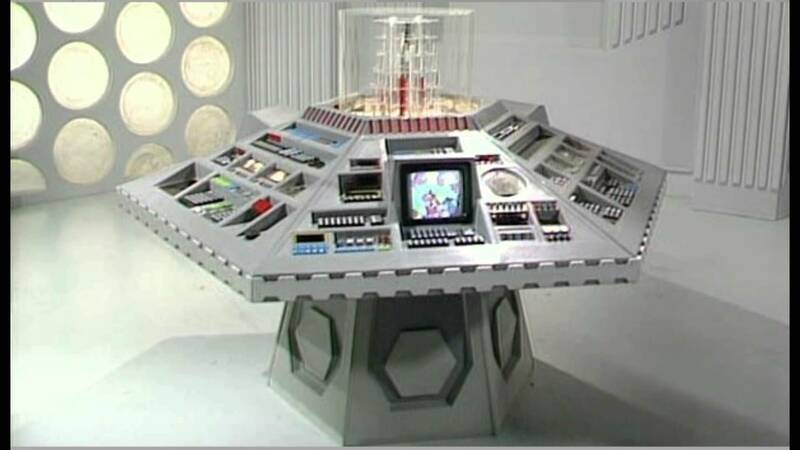 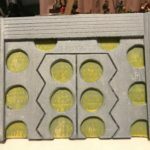 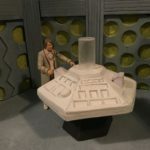 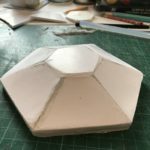 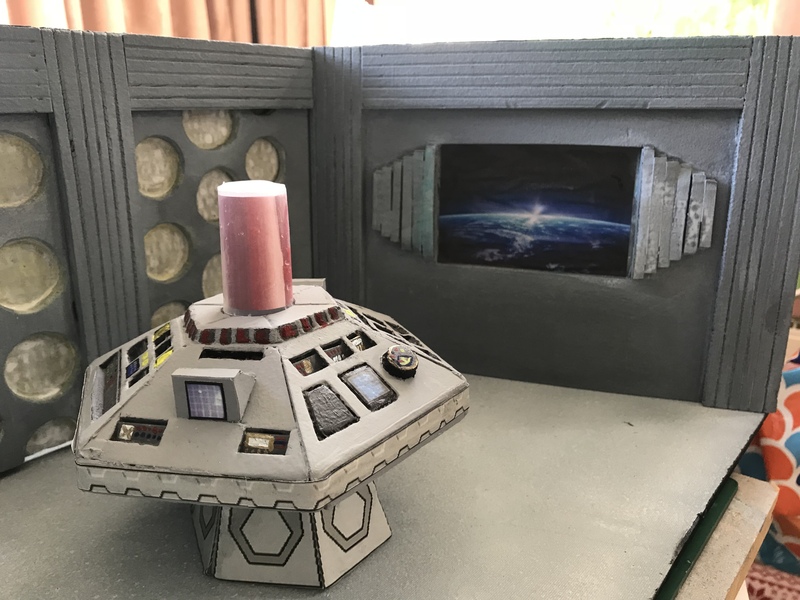 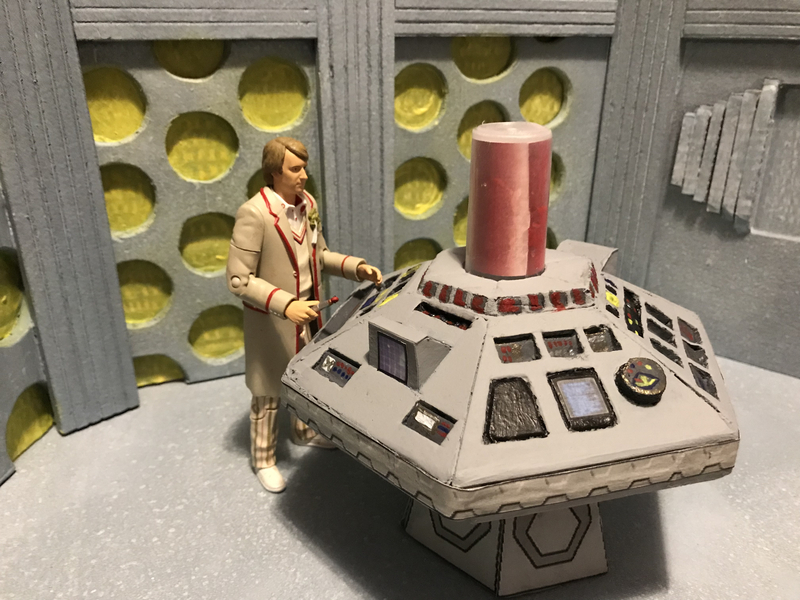 For the central console I used 5 mm foam board that you can buy from any art shop, using the a template that I had printed from AFT Downloads 1980’s Tardis interiors. 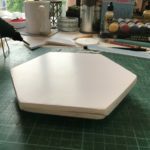 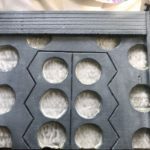 I cut each upper and lower panel, top and bottom hexagonal panels, a larger hexagonal piece to sit at the core of the console. 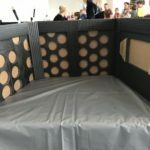 Each console panel had their inside corners cut to an angle, making each piece corners fit together and glued together. 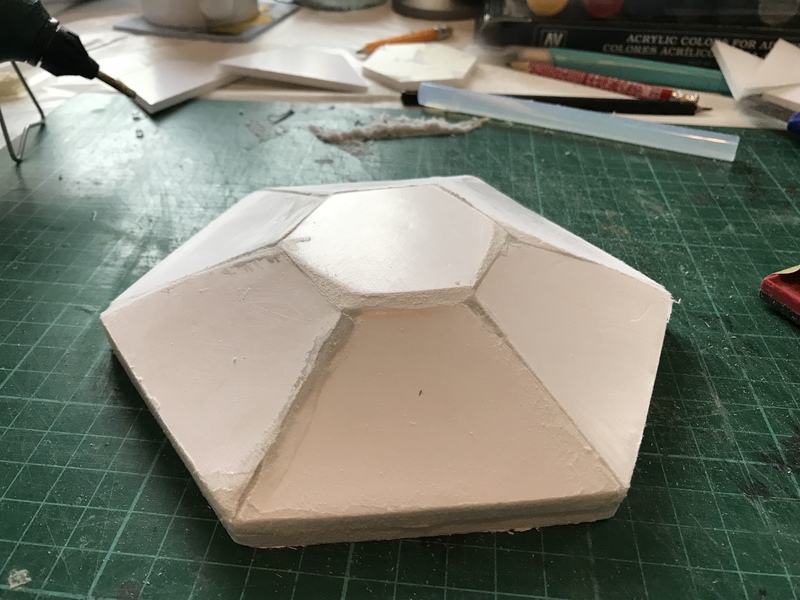 With the lower half made, this was glued onto the larger hexagonal piece and sanded down. 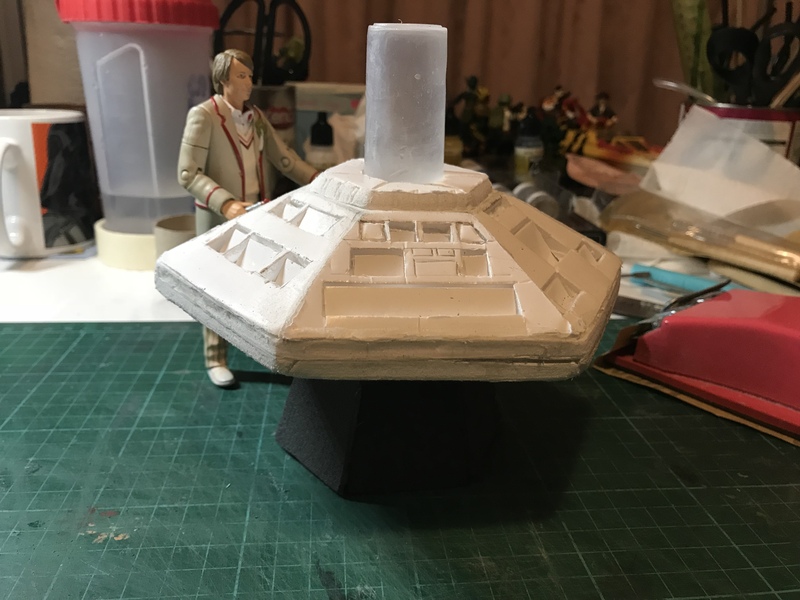 I repeated the same process for the top of the console, but before I glued it to the rest of the base. 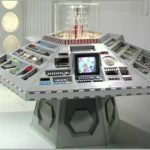 I marked out each console and monitor that the 1980’s style console had. 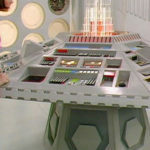 When I was researching pictures of this console, I had noticed with this particular console, all the monitors, keyboards, switches were sunk into the console unlike previous versions. 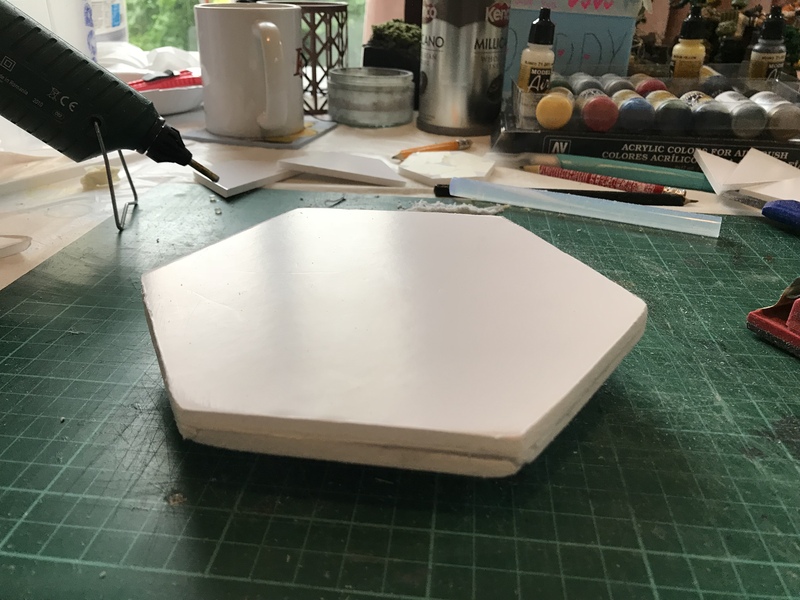 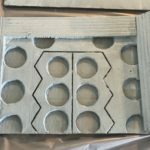 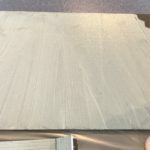 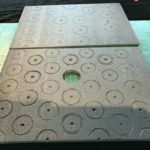 To achieve this look, I took my exacto knife and carefully sliced each piece, scoring the top, then cutting the sides and base. 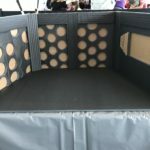 With this done, I pushed each part through then using hot glue, I glued the bottom of each sunken panel to the inside. 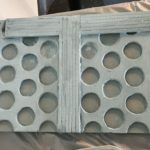 This section was then glued to the lower part, sanded down to remove any imperfections before moving on. 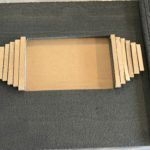 I cut made the two monitors with card, folding them round to make monitors and then gluing them on to the main console. 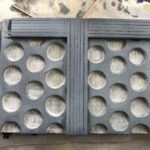 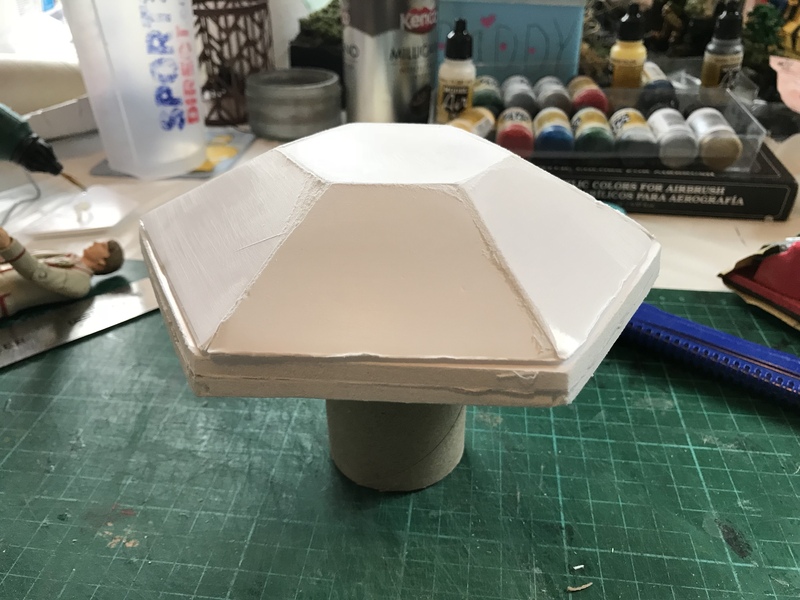 I cut a second hexagonal piece, cut a circle out of the middle and then sanded down the sides to fit the central column onto. 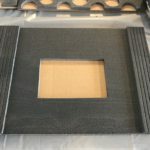 With this done, it was time to make the stand the console sat on, cutting six pieces of black foam, trimming and sanding each of the inner sides. 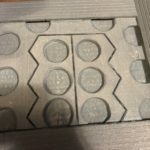 These were then glued to the bottom hexagonal piece. 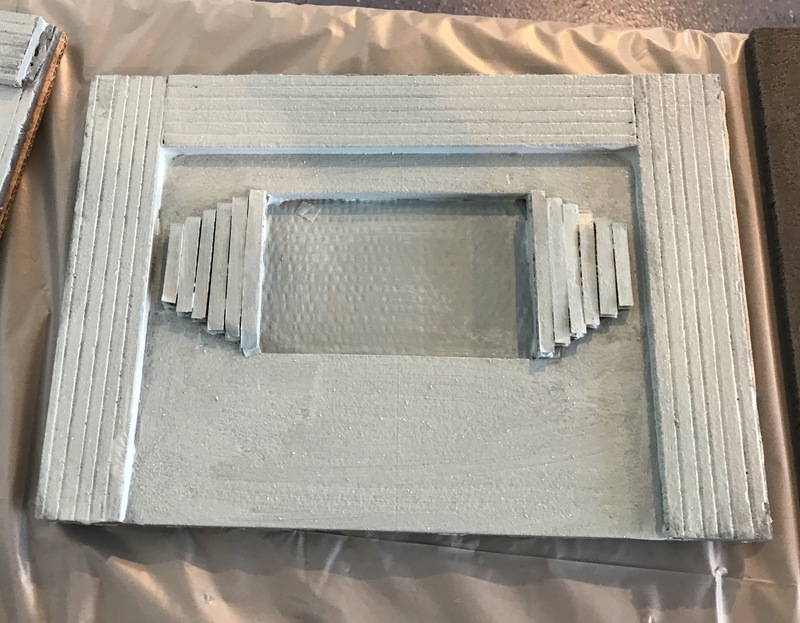 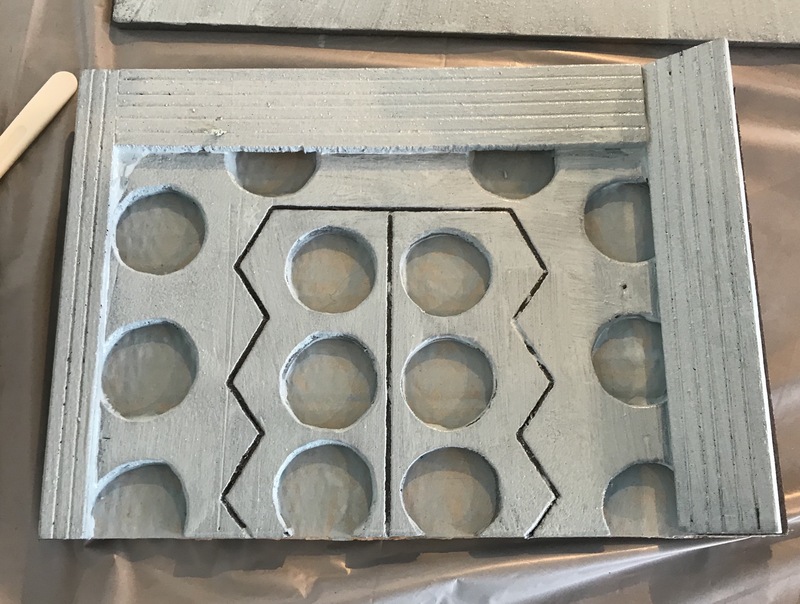 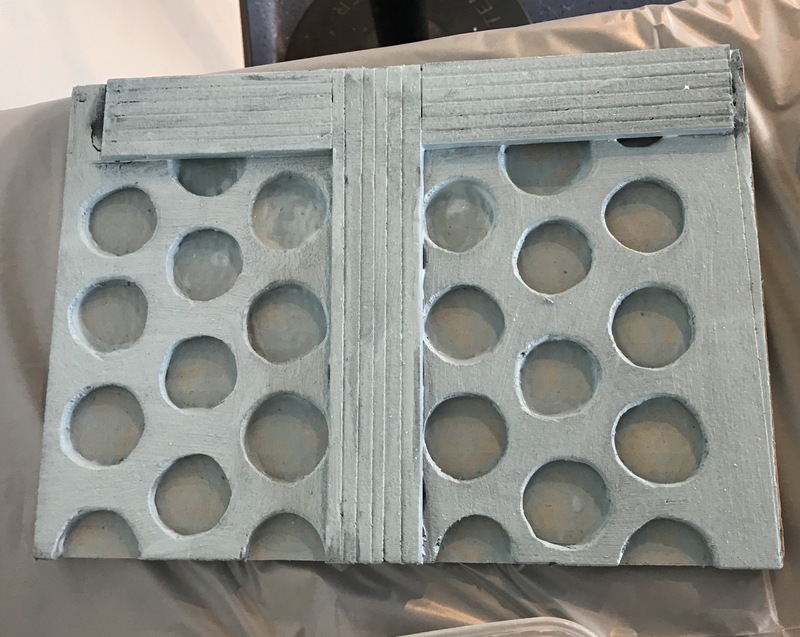 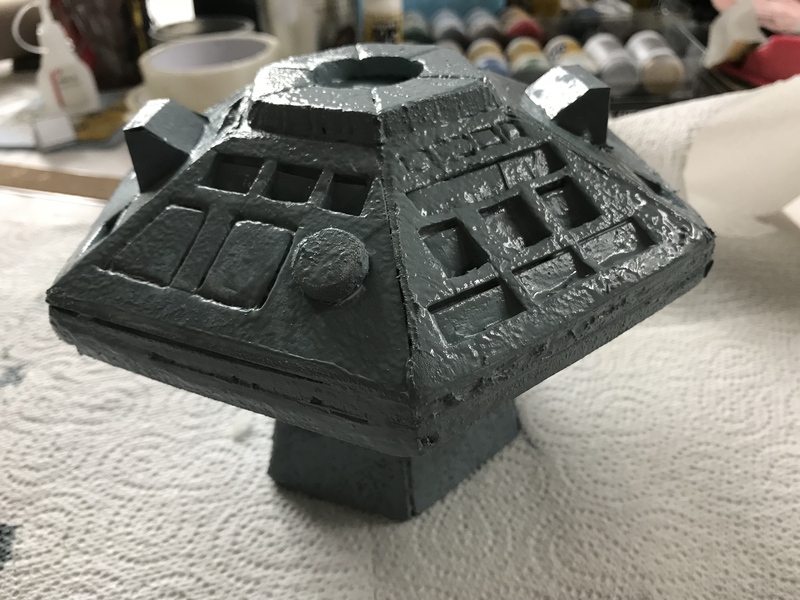 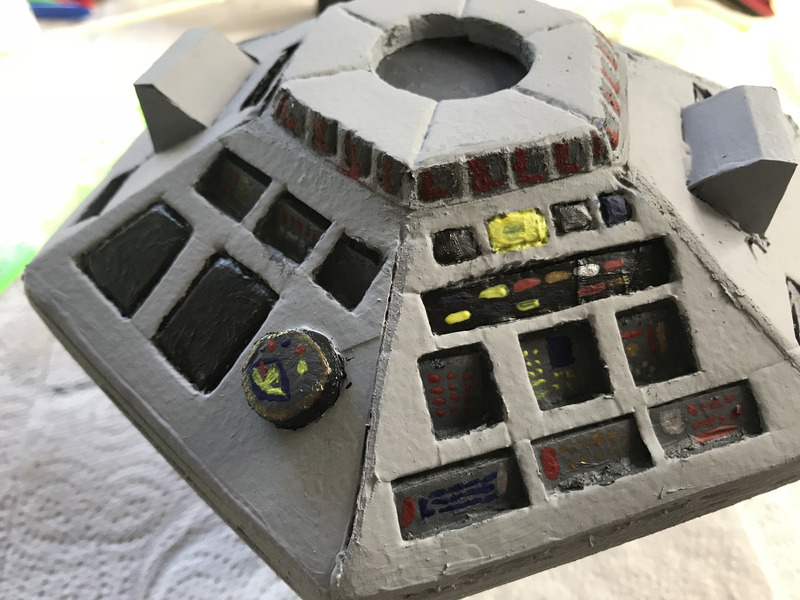 I applied the first coat of paint which when it dried, I found it was too dark to which the second coat I made was a lighter grey and when dried it looked how I wanted it to. 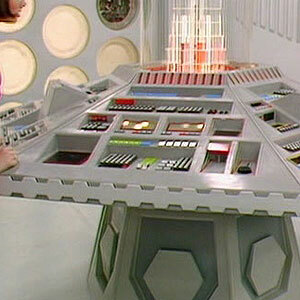 With the embedded consoles, I painted each one a dark grey, monitors a combination of black, yellow and blue. Due to the size of the center console I painted on each button and slider with a combination of red, blue, yellow, silver, gold and white. 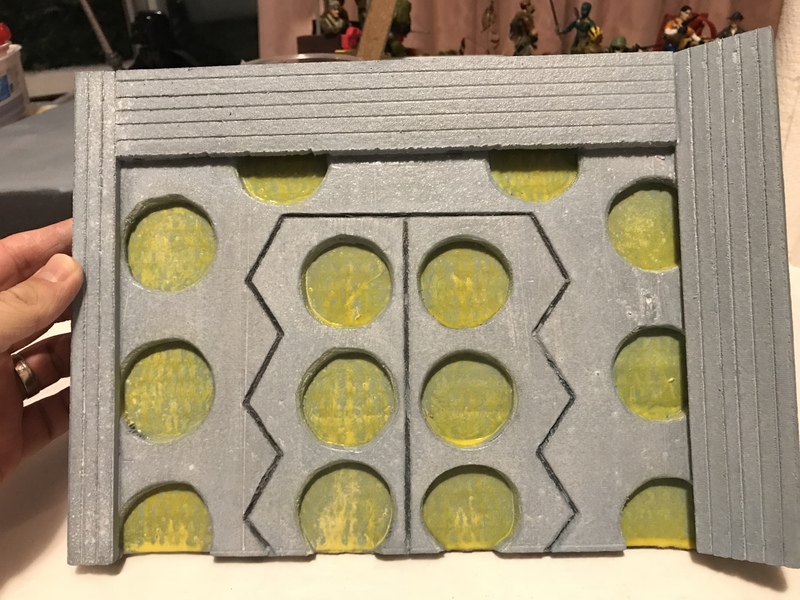 With the console finished I went back to the round things and using my airbrush, went over the insides with a light yellow to soften the already well rings. 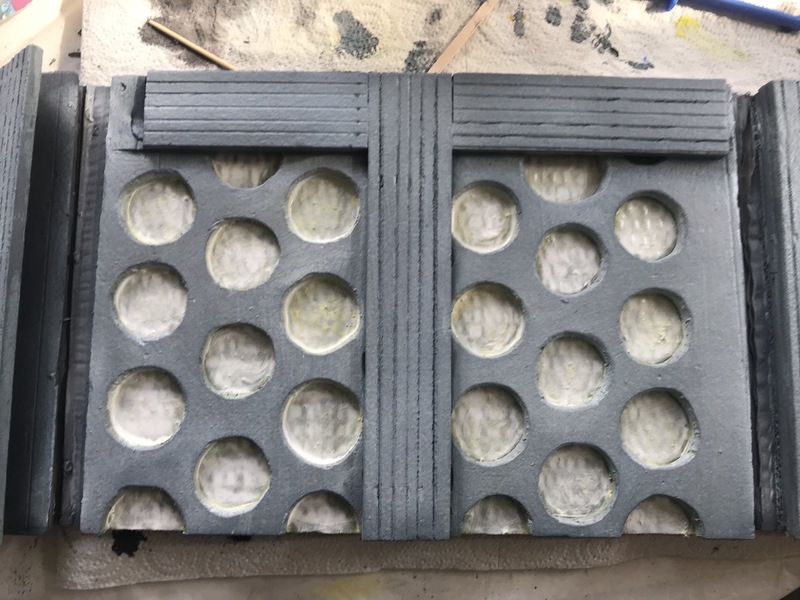 I had been looking at the “round things” and the yellow wasn’t working for me. 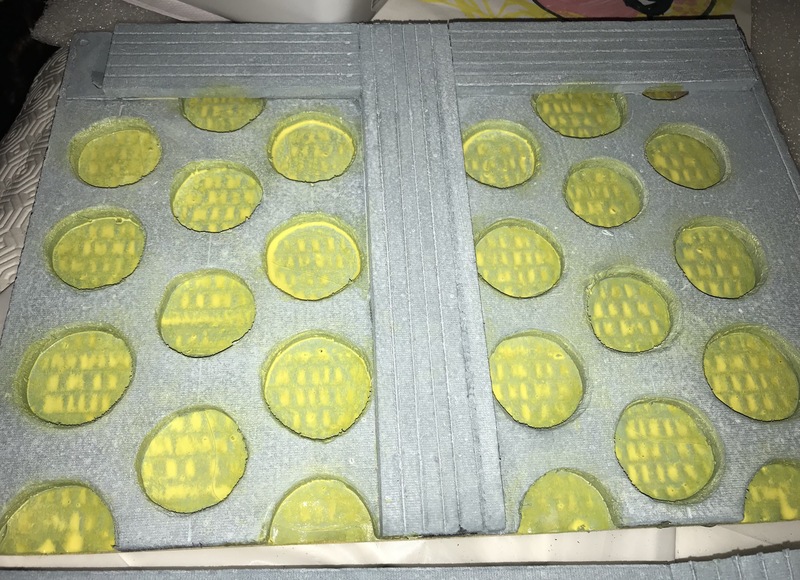 I decided to grey them out, then applied a lemon yellow to them, when that had dried a white coat was then added. 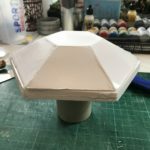 To keep the center console in place, I cut down a toilet roll and glued it onto the floor to which the console will sit over. 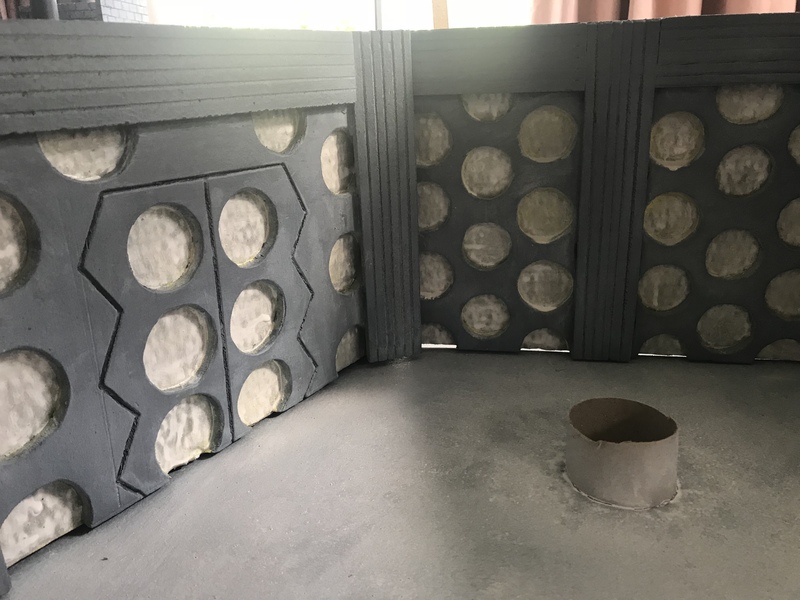 I trimmed the base to size that fits the shape of the walls, three borders were cut and stuck to edges to hold the walls in place because I have made this diorama to collapse and painted the edges black. 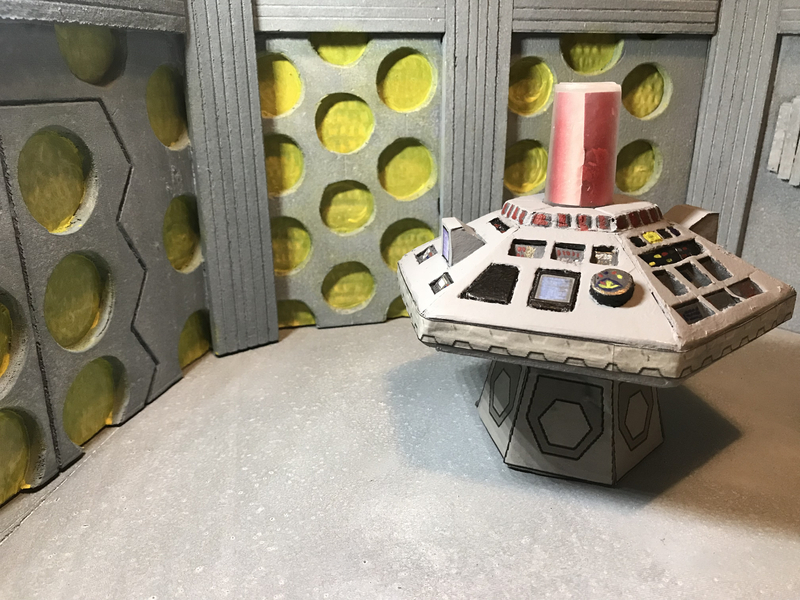 I used a decal for the monitor which now completes my latest diorama.